Albion's second season in the Premier League kicks off on Saturday and we're bringing you a new weekly podcast throughout the year. The Seagulls get their campaign underway at Watford and our 'Seagulls Weekly podcast' will be brought to you every Wednesday evening. In our first podcast, Sussex Newspapers sports editor Mark Dunford discusses the upcoming season with chief football reporter Steve Bailey and Albion fan and reporter Sam Wilson. 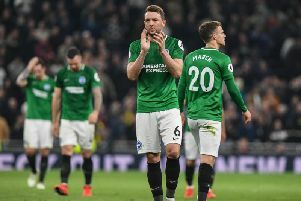 Among the topics this week are how Albion will fare in the top flight this year, who the Seagulls' key players will be, a look at the club's summer recruitment and where Brighton need to improve this year. We also pick out who the club's top fantasy football options are. Click on the video above - edited by Sam Wilson - to watch our first podcast of the new season.